I just love sunflowers. Maybe because I am tall and they stand up so tall in a garden. No mater where I live, my kitchen has always had a sunflower theme. 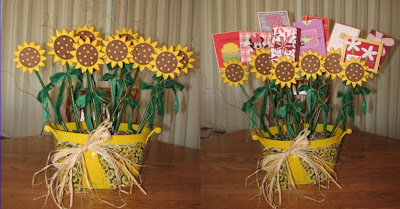 I created this cheery sunflower pot for a friend of mine as a thank you and had others that participated make cards to put in behind the sunflowers on pins that I had tied on the wooden dowels.